But sometimes you’ve got to give a commie his due. The world lost a pioneer today, Mikhail Kalashnikov passed away today at the ripe old age of 94. His lasting legacy will be the firearm that bears his name, the Avtomat Kalashnikova that he created in November of 1947; thereafter known colloquially as the AK-47. Despite being the poster child gun for gun controllers who wish to stamp out so called “assault rifles” the AK-47 is one of the most impressive rifles of the modern era. Compared it a M-16, which can be fickle in both weather and cleaning, the AK can be tossed in a mud pit, covered in sand, run over by a truck, left there over the winter and still be ready to fire when you pull the trigger. It was made to last and it was built to work under many harsh conditions. It’s creator, after suffering a serious wound while a tank commander in WWII, saw himself on a prolonged convalescence, and the idea came to Kalashnikov while recooperating. Over time, through trial and error his masterpiece was finalized. Where the M-16 would fail in the early years of its deployment due to its complexity and exacting measures the AK-47 worked well for exactly the opposite reason. 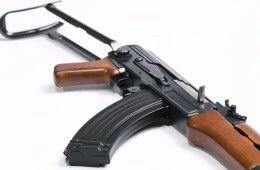 The AK-47 is not a weapon designed for accuracy tests at the firing range. It is a weapon for firefights at close quarters, in harsh Russian conditions. It can be assembled by a person with no military training, is fired by simply pointing at a target, and it can be easily looked after without a cleaning kit. It does not jam by itself (due to the generous allowances between moving parts) and it does not stop functioning in any weather conditions. I tip my cap to the genius of simplicity. It is that simplicity that has made the weapon the most ubiquitous firearm in all the world for more than 65 years. Now, the gun haters would like to tear this man down for creating such a well loved firearm. As if he himself is somehow responsible for the use of the tool he created by every pair of hands that touched it. Kalashnikov has no more responsibility to the ill use of his invention than does Nikolaus Otto has for some speeder in car who kills a family. Nikolaus Otto, in case you didn’t know, improved the internal combustion engine to make it practical in 1867. I guess all innovation and revolutionary designs can’t come from America. Doesn’t mean I won’t tip my cap to a man who called another land his home. Nor will I dissuade anyone from going out and buying one of these fine weapons before they are all snatched up…by either other gun owners or the government…whoever comes first.